Good decisions require a lot of data. That is why energy self-sufficient sensor networks with evaluation logic and wireless communication at a low price can improve decisions in many cases: Locating sources of smoke and toxic gases in rooms, measuring spatially resolved nutrient requirements in a field in order to avoid over-fertilization, broad monitoring of water quality in terms of environmental toxins or germs, medical examination or metered administration of medicine in the body without an open connection to the outside are just a few of the potential applications. It should possible to use the system to develop highly integrated components that combine sensors, actuators, data processing, energy storage and wireless communication in the smallest of spaces. Atomic layer deposition (ALD) is ideal for a high level of integration density because it allows uniform coating of 2D as well as 3D structures such as grooves or upright cylinders at the microscopic level. 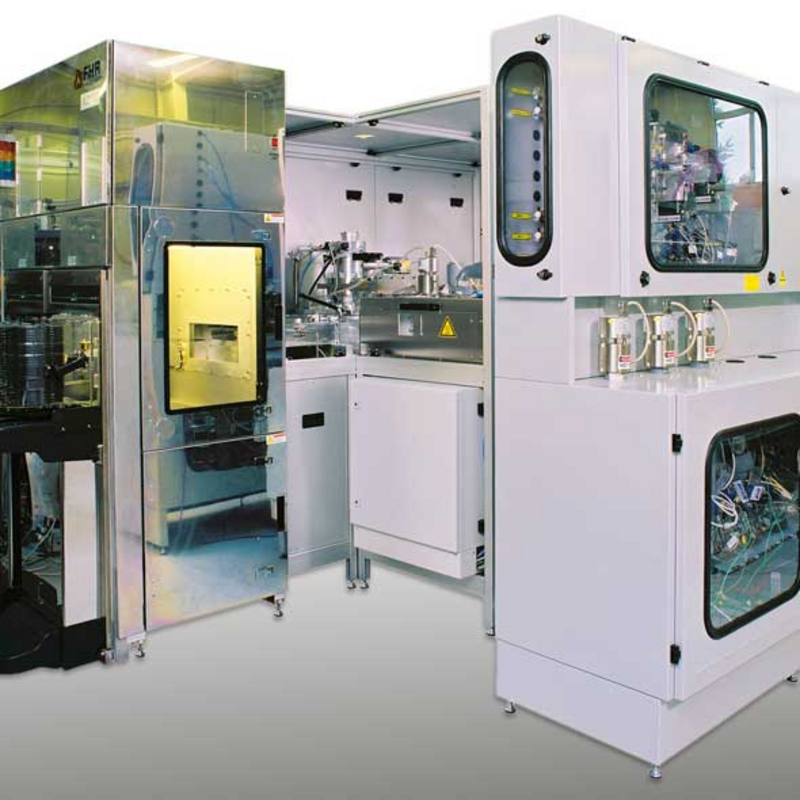 The system is used for development and sample production on an industrial level so it should be able to receive and coat batches of 300 mm wafers via a standardized FOUB interface. At the same time, as a development system it also needs to be able to process materials such as lithium, gold or copper in CMOS processes, offer a wide variety of ALD processes (plasma ALD and thermal ALD in cross-flow and shower-head reactors) and have options for later modification by the user or manufacturer for new research projects. Finally, the system needs to be able to complete complex recipes automatically, continuously record all process data and allow for different user levels. The FHR.Star.300-ALD is a cluster system for 300 mm wafers. Wafers are removed from a standardized wafer cassette and transported into the vacuum lock via an FOUB interface. A robot in the central chamber of the vacuum system retrieves the wafers from the lock and transports them to one of the two process chambers: A plasma ALD chamber and a chamber for thermal ALD. The thermal ALD chamber can optionally be equipped with a shower-head or cross-flow reactor. The gas and precursor cabinets of the chambers provide space for a variety of gases and precursors. As is usually the case with FHR systems, this system has comprehensive automation with access to all components and a convenient recipe management system.